Why Choose a Family Law Specialist? Sarah T. Schaffer, Esq. is known and respected in San Diego for her honesty, integrity and ethics as a Certified Family Law Specialist, Divorce Attorney, Courtroom Litigator, Mediator, and Colonel in the United States Marine Corps Reserves as a respected JAG officer. Attorney Schaffer will not advise you to take a case to trial if it can be fairly and equitably resolved outside of the courtroom. On the other hand, if your case involves an issue that demands litigation to protect your interests, you can depend on Sarah to aggressively fight for your rights. Sarah T. Schaffer, Esq. is the founder of the Law Offices of Sarah T. Schaffer, APC in the seaside city of Del Mar, in the County of San Diego, California which provides Divorce and Family Law legal services. Formerly, attorney Schaffer had the privilege to spend four years practicing law at Higgs, Fletcher & Mack LLP in San Diego. Ms. Schaffer, a State Bar Certified Family Law Specialist, builds her practice on a thorough knowledge of the law, excellent research skills, superior presentation to the Court, and most of all calm, compassionate relations with her clients in times of trouble or crisis. She possesses a wealth of experience in family law including representing clients with challenging child custody issues as well as high asset clients in complex division of community property matters. As to division of community property, Sarah’s LL.M. degree in Taxation often saves her divorcing client and their spouse from significant financial losses by exploring creative settlement agreements that work to take full advantage of the tax code given each spouse’s financial position. Sarah takes into consideration each spouses income, their current and future tax bracket, will offer a variety of creative options to save significant money that might otherwise be paid unnecessarily to the tax authorities. Where spousal support is required, Sarah can often suggest settlement options that will save unnecessary tax liabilities for both the payor-spouse and the payee-spouse. Creative property division settlements, when structured by an experienced attorney, might involve a mix of real property and support payments that better benefit Sarah’s client –and– the client’s spouse as well. A well-conceived settlement agreement that is good for both spouses, avoids unnecessary yearly tax liabilities and other pricey tax hits while dividing tax-sensitives assets such as IRA’s, 401k’s, the family home, stocks, bonds, and that also supports each spouse’s personal goals as they go forward to live their separate lives will create a friendly and amicable climate in an otherwise stressful life event. Sarah’s creative, tax-smart settlement options often lessen or eliminate unneeded emotional stress and financial turmoil by lessening the government’s slice of the overall pie that is better preserved for the benefit of the spouses and any children. Sarah Schaffer was raised in the Boston area. Ms. Schaffer moved to California where she attended and graduated from Stanford University with Departmental honors and a dual major in Spanish and International Relations. During this time, she spent a year studying at the University of Salamanca in Spain. Sarah is fluent in Spanish. First generation Spanish speakers are often thankful for someone they can share their legal matter with in both English and Spanish. Upon graduation, Sarah T. Schaffer was commissioned in as a Second Lieutenant in the United States Marine Corps and spent five years on active duty serving as a logistics officer in Okinawa, Japan, and Quantico, Virginia. 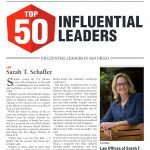 In addition to her private Family Law practice, Sarah T. Schaffer currently serves as a Commander in the United States Marine Corps Reserves acting as a JAG officer at the Western Area Counsel Office at Camp Pendleton. Retired military members find working with Sarah comfortable with their shared background and service to Country. Active military members appreciate Sarah’s ongoing experience as a JAG officer when facing Family law issues such as divorce, child custody or even domestic violence allegations that can potentially reflect poorly on their military career if not defended aggressively for the best possible outcome. Others appreciate Sarah’s LLM in Taxation for handling complex or high net worth property division and QDRO experience with pension and retirement accounts in divorce matters. In 2001, Ms. Schaffer received her law degree from the University of San Diego School of Law. After passing the California Bar Exam, Ms. Schaffer joined Ernst & Young in San Francisco where she worked as a tax consultant.In 2011, Ms. Schaffer was awarded her Master of Laws (LL.M.) in taxation from the University of San Diego School of Law. In 2011, Ms. Schaffer earned the the coveted title of Certified Family Law Specialist by the State Bar of California Board of Legal Specialization.